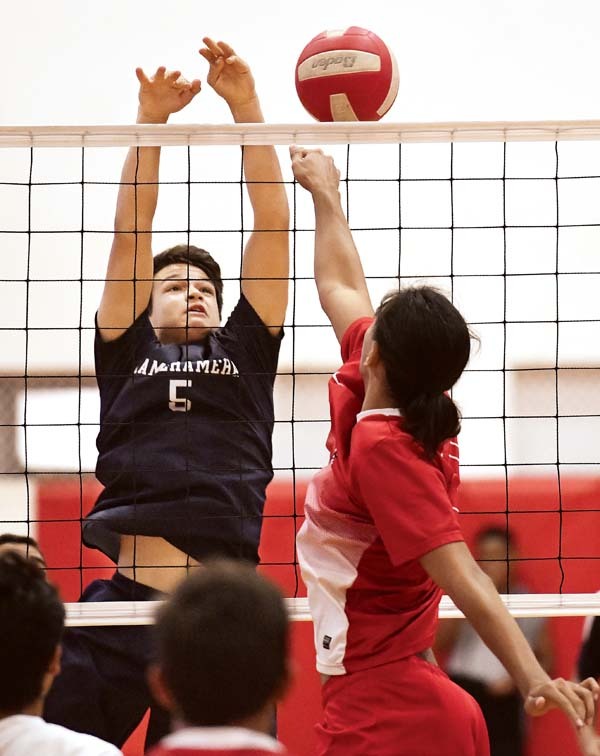 LAHAINA — Austin Peters led the Kamehameha School Maui boys volleyball team to its first Maui Interscholastic League title in eight years last season. The Warriors accomplished that the hard way, having to win the MIL tournament and then an overall playoff for the title against King Kekaulike. This year, Kamehameha is trying to come in through the front door to win a second straight league crown. They took a major step in that direction with a 25-22, 25-22, 25-22 sweep over Lahainaluna on Friday night at the Lunas’ gym. “This is probably my favorite team that I have had so far because I can put the ball anywhere and I know that there is someone there who can kill the ball and there’s about five more guys off the bench who can do the same thing,” Peters said after he dished out 28 assists. The result left Kamehameha Maui at 8-0 and Lahainaluna at 6-2. With each team having four matches left in the MIL regular season, the Warriors are two wins from clinching the regular-season title and a state berth. Peters, the reigning MIL Player of the Year, also had six kills, five off of second-hit dumps over the net. 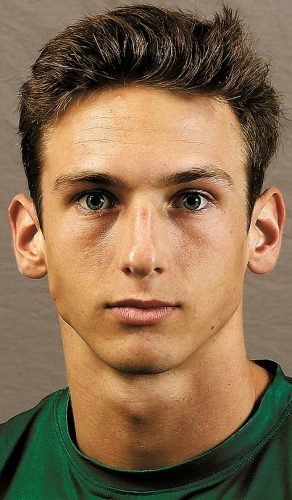 “It makes it so much more difficult for the other teams to know where I’m going, half the time I don’t even know where I’m going,” Peters said. Each set was close throughout. A dump by Peters gave Kamehameha a 23-21 lead in the first, and a double block by Noa Vierra and Raphael Adolpho finished it. In the second set, Lahainaluna led 9-7 before the Warriors rolled off a 10-5 run capped by a kill from Kahai Bustillos. 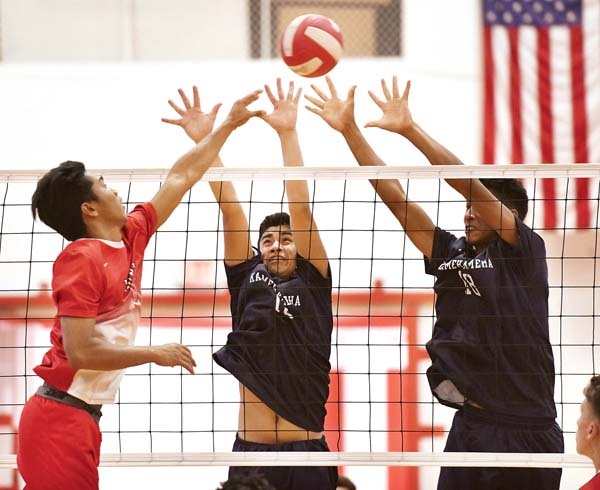 The Lunas tied the set at 19 and 20 before a net serve, a Peters kill and a Bustillos kill helped Kamehameha pull away. Back-to-back aces by Vierra gave the Warriors an 18-15 lead in the final set, and the Lunas would not catch them again. Vierra finished with 12 kills and Brennan Mendez had nine digs for the Warriors. The Lunas got six kills from Elijah Oliveira, and five apiece from Nick Gayagoy, Leo Amby and Aukai Kama. Both coaches know this rivalry has not yet ended for this season. 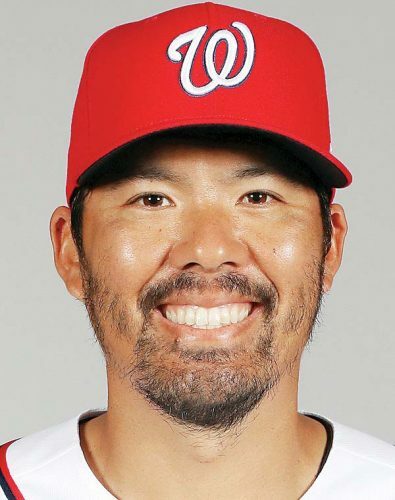 The third-round match looms in Pukalani on April 17, and the possibility of meeting again in the MIL Tournament is also a distinct possibility. Lahainaluna’s Carter Stockham was dressed but did not play after missing several practices during spring break. Kamehameha was missing Kamalu Segundo and Iverson Dudoit due to injuries, but both are expected back soon. Lahainaluna coach Dan Schultz said his team must find a way to solve the Warriors’ offensive attack that starts with their defense. 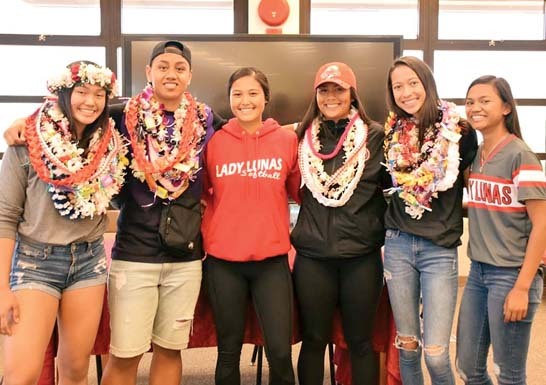 The Lunas are the only team to take a set off the Warriors this season — they forced the first meeting to four sets on March 13. Molokai at Lanai, 10 a.m.